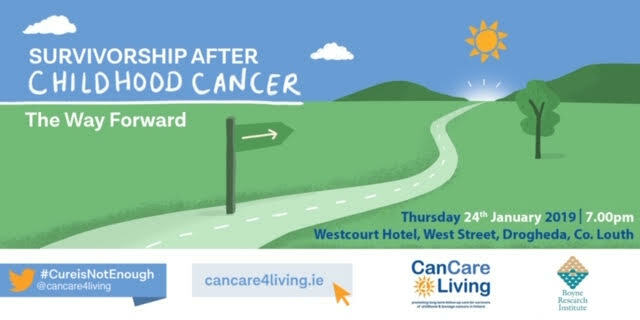 CanCare4Living, the national organisation for survivors of childhood and adolescent cancer and their families together with the Boyne Research Institute, and in co-operation with the Gary Kelly Cancer Support Centre will host a public meeting, on Thursday 24 January at 7pm, in the Westcourt Hotel, 29 West Street, Drogheda, Co. Louth. 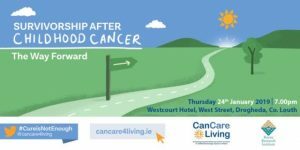 We would love to meet with survivors, their families, friends and supporters, advocacy groups, health care professionals or researchers. Hear from adult survivors who will share their personal experiences with us. Parking is available nearby at the Stockwell Lane carpark (until 10pm) and Dominick Street carpark (24hr). The meeting is FREE, but to help us with our planning we would appreciate if you could register using the form below.